Eumir Deodato de Almeida (Brazilian Portuguese:born 22 June 1942), also known as Eumir Deodato, is a Brazilian pianist, composer, record producer and arranger, primarily based in the jazz realm but who historically has been known for eclectic melding of big band and combo jazz with varied elements of rock/pop, R&B/funk, Brazilian/Latin, classical and symphonic or orchestral music. Deodato was born in Rio de Janeiro to Italian and Portuguese parents. He is a musical autodidact, starting with the accordion at age 12 but rapidly learning instrumental and orchestral skills that culminated in his first recording session at age 17. Mainly, his records can be categorized as pop/jazz or crossover jazz. His successes as an original artist (keyboards) occurred mainly in the 1970's. Since then, he has produced or arranged music in more than 500 albums for acts ranging from Kool and the Gang to Björk, Christophe and k.d.lang. 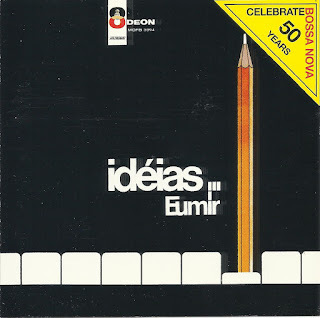 Ideias was originally released circa 1964/1965 and when you listen, you will hear the musical roots of a very young man who was to become the wunderkind of Brazilian then later American jazz. You'll notice that unlike some of his later work, the arrangements and the interpretations are fairly straightforward and unadorned. But it is still very listenable with an even quality throughout. 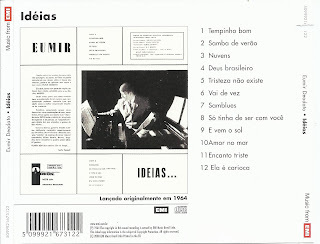 Those familiar with bossa nova will know most or all of the tunes here.